Hitachi announced Tuesday it is purchasing Sullair, air compressor manufacturing company based in Illinois, from Luxembourg-based Accudyne Industries for $1.24 billion in a move designed to mesh greater global market presence with data monitoring. Hitachi has been developing its industrial products units, placing air compressors in a core business position. The company already provides air compressors to Japan and Asia. The Sullair acquisition will provide Hitachi with 200 Sullair North American dealers, with an estimated 4,000 end users. Sullair customers use portable compressors in construction, mining, and oil & gas applications. Hitachi is positioning air compressors as a key segment because "clients come from a wide spectrum of areas, the aftermarkets are established, so we foresee stable earnings," Masakazu Aoki, executive vice president, told reporters on Tuesday. The company hopes to do $900 million in global air compressor business by 2020. 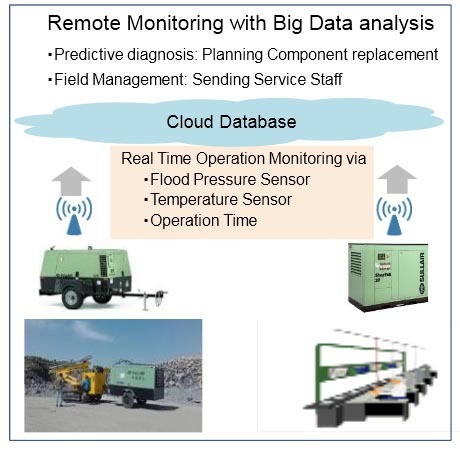 Air compressors will be bundled with predictive diagnostic services made possible by Lumada, the "internet of things" platform developed by Hitachi. The company can remotely monitor the machines' operational status via sensors. The deal is subject to normal business procedures and is targeted to close later this year.